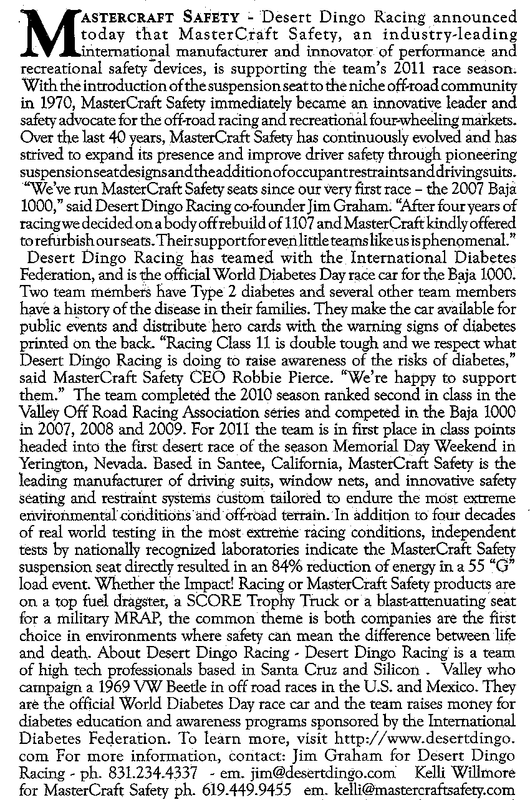 Desert Dingo Racing announced today that MasterCraft Safety, an industry-leading international manufacturer and innovator of performance and recreational safety devices, is supporting the team’s 2011 race season. Brian Driggs, Gearbox Magazine —For those who haven't seen it, "Dust to Glory" is an epic movie about what it takes to run the Baja 1000 in Mexico. There probably isn't a gearhead on the planet who hasn't watched that flick and thought, "OMG. I wanna do that." Jim Graham, co-founder of Desert Dingo Racing, is one such gearhead, and OMG. He actually went out and did that. Here's how. Felton, Calif., April 19, 2011 – Satellite Telework Centers CEO Barbara Sprenger announced today the company is being recognized for its environmental leadership by the respected environmental advocacy organization Acterra. The Valley Off Road Racing Association has launched a new website that includes profiles of race teams. We're the inaugural feature. Desert Dingo Racing announced today that BRØKINBØNZ® Clothing, an injury based line of clothing and accessories, is sponsoring the team's 2011 race season. BRØKINBØNZ is providing the team with customized t-shirts, hoodies and accessories based on the number bones each team member has broken.